I highly recommend the services of Western Granite. I have been using Western Granite for the past year, and have always been completely satisfied. Western does an excellent job throughout the entire process from personalized customer selections through installation. They are always punctual, and offer the most competitive rates in town. They stand behind their product, and warranty their work. As a contractor, it is important for me to use a reputable granite company….and I highly recommend Western Granite. I am writing to recommend the services of Western Granite & Stone Ltd. I have been using Western Granite & Stone as my natural stone fabricator for the past year and half, and have always been completely satisfied. Their excellent craftsmanship is apparent in the details. The company places much emphasis on quality, timely installation, and I’m very happy with their competitive pricings. We have hired them to complete a couple homes worth $2 million plus. They have been careful to achieving satisfactory results. The company has done exactly what we’ve asked of them each time. 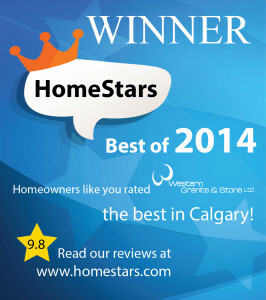 It’s my pleasure to recommend the services of Western Granite & Stone Ltd. Please consider this natural stone fabricator for your future jobs. – Jason Jakeman, 851272 AB Inc.